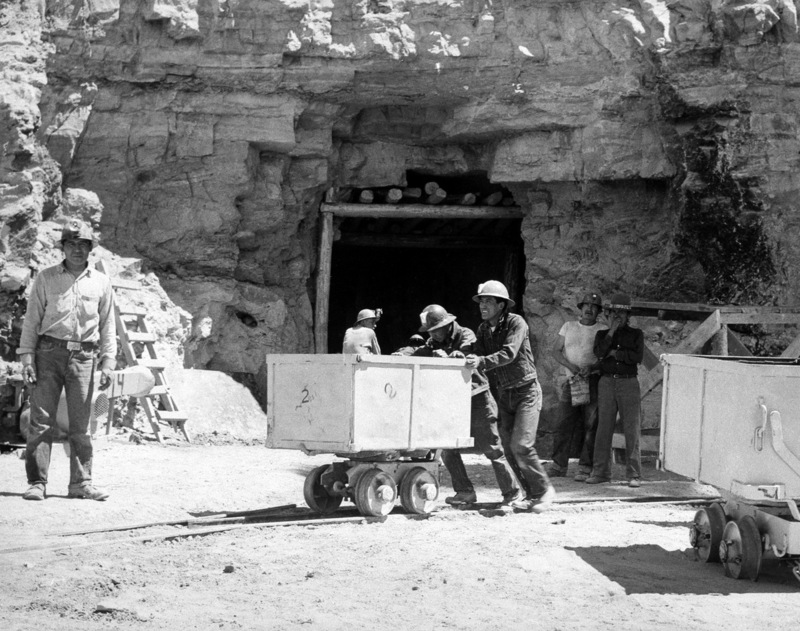 For The Navajo Nation, Uranium Mining's Deadly Legacy Lingers : Shots - Health News Uranium mining on Navajo lands ended in 1986, but the tribe is still suffering profound health effects. The government started cleanup only recently; many of the polluters have gone out of business. Navajo miners work at the Kerr-McGee uranium mine at Cove, Ariz., on May 7, 1953. When they did the mining, there would be these pools that would fill up. And all of the kids swam in them. And my dad did, too. One of the study's findings: 27 percent of the participants have high levels of uranium in their urine, compared to 5 percent of the U.S. population as a whole. Welch, who is Navajo, got involved in the study because of her own family's exposure to uranium. Both of her parents grew up next to mines, even playing in contaminated water. "When they did the mining, there would be these pools that would fill up," she says. "And all of the kids swam in them. And my dad did, too." Many Navajo unwittingly let their livestock drink from those pools, and their children play in mine debris piles. Some even built their homes out of uranium. 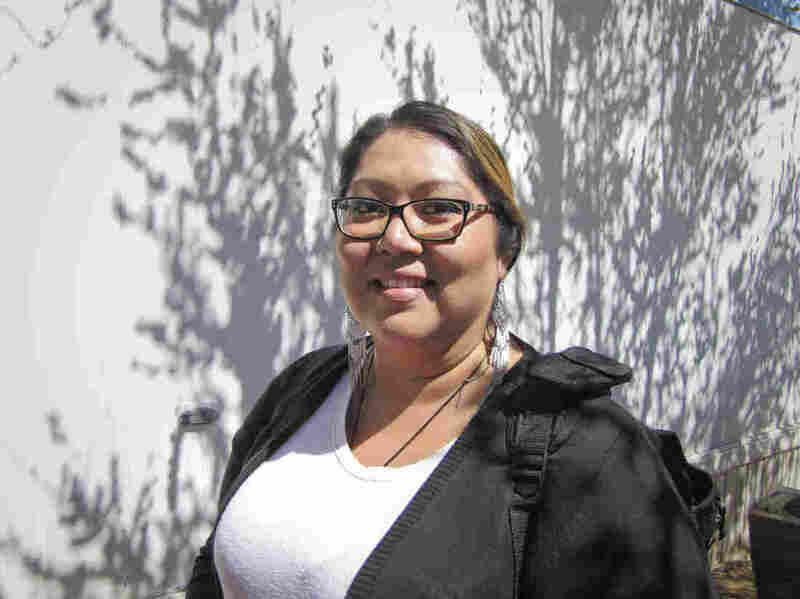 Maria Welch is a researcher studying the impact of uranium mining on Navajo families today. She also has a personal interest: Both her parents grew up next to mines. All four of Welch's grandparents have died, and she worries about her parents' health and now her daughter's. Cancer rates doubled in the Navajo Nation from the 1970s to the 1990s. "Why isn't there more of an outrage? Why isn't there more of a community sense of what the heck is going on? How did this happen? Why is this still occurring? Why hasn't anything been done?" she asks. George McGraw, a human rights advocate working on the Navajo Nation, has one answer. "Problems like this really disproportionately affect low-income communities of color," says McGraw, whose organization DIGDEEP is raising money to dig wells on the reservation. "Flint (Michigan) might feel really far away from the Navajo Nation in rural Arizona. But when you look at the demographics of it, it really isn't," he says. "This is a community that has found themself voiceless." The U.S. Justice Department has recently gone after some of the mining companies. Since 2008, the Environmental Protection Agency has hauled away thousands of cubic yards of mine waste and has rebuilt nearly 50 contaminated homes, says EPA Regional Administrator Jared Blumenfeld. But there's still much more to be done. "We're spending a lot of time making sure that the polluters pay, so it isn't the federal taxpayer," he says. One company, Anadarko Petroleum, and its subsidiary Kerr-McGee recently paid $1 billion to the Navajo Nation for cleanup and as compensation to people living with the effects of uranium contamination. But one-third of the mining companies have shut down or have run out of money. The federal government knew about some of the dangers decades ago, but only started the cleanup in recent years. "We understand that there's frustration," Blumenfeld says. "We share that frustration that some of this takes a long time." And the uranium issue on the Navajo Nation is part of a much bigger problem. Across the western United States there are more than 160,000 abandoned hardrock mines — thousands of which continue to pollute.